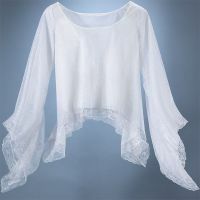 Eternal Love White Minstrel Top Cobweb [2075W/R] - $32.29 : Mystic Crypt, the most unique, hard to find items at ghoulishly great prices! Eternal Love White Minstrel Top Cobweb. This gorgeous top fits slightly off shoulder and it features white fabric with scalloped lace trim under a white spider web lace overlay. Exaggerated pointed hem and bell sleeves are part of what make this item so alluring! Very roomy and comfortable. Find more Plus Size Gothic Clothing, Gothic Clothing and more at Mystic Crypt!